Buy wholesale Coffee Mate creamer from the restaurant supply superstore for your restaurant, hotel, breakroom, or coffee shop. Coffeemate is by far the #1 brand of coffee creamers on earth. Nestle Coffee Mate Regular Liquid Cream Portion Control - 0.38 Oz. Nestle Coffee Mate Regular Powder Creamer - 16 Oz. 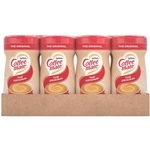 Nestle Coffee Mate Shelf Stable Base Powder Creamer - 6 Oz. Nestle Coffee Mate Carnation Original Creamer - 22 Oz. Nestle Coffee Mate French Vanilla Powder Creamer - 15 Oz. Nestle Coffee Mate Hazelnut Powder Creamer - 15 Oz. Nestle Coffee Mate Lite Powder Creamer - 11 Oz. Nestle Coffee Mate Hazelnut Liquid Creamer Portion Control - 0.38 Oz. 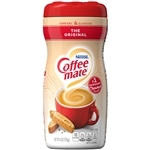 Nestle Coffee Mate Original Creamer - 11 Oz. Nestle Coffee Mate Original Creamer - 3 Grm. Nestle Coffee Mate Regular Powder Creamer - 11 Oz. 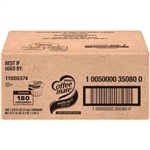 Nestle Coffee Mate French Vanilla Liquid Creamer Bulk - 192 Oz. Nestle Coffee Mate Irish Liquid Creamer - 0.38 Oz. Nestle Coffee Mate Irish Liquid Creamer 0.38 Oz. 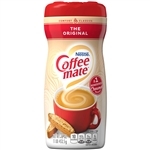 Nestle Coffee Mate Regular Liquid Creamer - 0.38 Oz. Nestle Coffee Mate French Vanilla Liquid Creamer Portion Control - 0.38 Oz. Nestle Coffee Mate French Vanilla Liquid Creamer Portion Control 0.38 Oz. 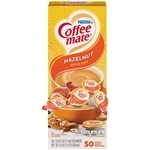 Nestle Coffee Mate Hazelnut Liquid Creamer - 0.38 Oz. Nestle Coffee Mate Regular Liquid Creamer Portion Control - 0.38 Oz. 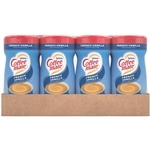 Nestle Coffee Mate Regular Liquid Creamer Bulk - 192 Oz. 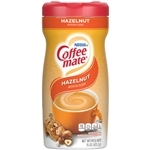 Nestle Coffee Mate Hazelnut Liquid Creamer Bulk - 192 Oz. 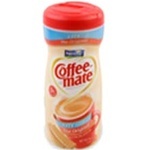 Nestle Coffee Mate Liquid Cafe Mocha Creamer - 0.38 Oz. Wholesale Coffee Mate creamer for your breakroom, restaurant, or hotel.